Neckties can be the basis for many unique craft projects. Necktie craft projects are a great way to give old ties a new life. It's a frugal craft project, since you're using materials that would otherwise be discarded. Recycling fabrics is good for the environment, since you're reducing the amount of waste in landfills. Neckties are often made from beautiful and unique fabrics. A project made with old neckties has great sentimental value if you're using ties that were once owned by your father, grandfather, brother, or husband. Wash your ties to remove any dirt or stains. Place five or six ties in a pillowcase, then tie it in a knot. If you wash the ties loose, they'll get tangled in the machine. Clip the two anchoring stitches on the top and bottom of the underside of the tie, then pull the thread out to remove the lining of the tie. Separate your piles by pattern, color, or theme to make it easier to find what you're looking for when you begin your project. Let an old tie double as a clever curtain tieback. Use a tie as a belt substitute when wearing your favorite pair of blue jeans. Embellish a Father's Day scrapbook layout with a border made from an old necktie. Use a tie in a shadowbox featuring memorabilia of your father or grandfather. Cut the tip off a tie and trim with a pretty ribbon to make a simple bookmark. If you're looking for a more involved project, or have a large collection of ties available for your crafting, there are a number of home décor and fashion projects you can adapt to suit your needs. Necktie Pillow: When you choose ties that have a common color or pattern, a necktie pillow makes a lovely accent for your bed or sofa. Necktie Quilt: A quilt made from old neckties can be a wonderful way to honor the special men in your life. Necktie Chair Cover: Give an old piece of furniture a new look by weaving together ties to make a chair cover. Necktie Flowers: Use these flowers as magnets or stitch them onto plain storage boxes to breathe new life into your home office. Necktie Bag: Ties may be a masculine accessory, but it's easy to transform a collection of them into a funky handbag any woman would be proud to carry. Make a Necktie Scarf: While it won't be warm enough to wear during a cold Midwestern winter, this scarf will certainly jazz up any outfit. Necktie Skirt: Necktie skirts are flattering to a variety of body types. Vary the color of the ties you use and the length of the skirt to create several different looks from the same basic pattern. 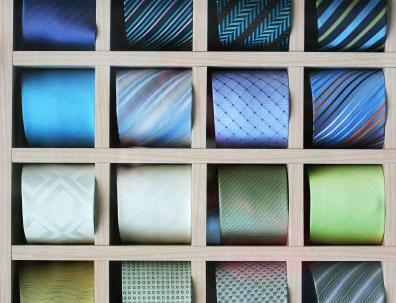 To Tie a Tie has some tips on removing stains and wrinkles from your ties. Artful Ties is a blog with creative ideas for using neckties, including dyeing Easter eggs, making wall art, and sewing high fashion formal gowns. Sewing with Neckties features pictures of projects completed by crafters of varying skill levels. This is a great site to use for inspiration when designing your own unique necktie craft projects.